A pair of fierce, angry eyes followed me as I moved toward the exit of the conference room. I had just delivered a talk about climate change standards in education at a meeting of the Geological Society of America. The presentation was received well enough, though I’m not sure everyone in the audience understood all of my subtle references to Star Wars and The Big Lebowski. Now one visibly upset conference attendee stalked toward me with determination, and I resigned myself to endure one of the least enjoyable parts of scientific conferences: having to talk to people. “What about the Oregon Petition?” this man challenged me, pushing his finger into my chest. He explained that he had signed this Oregon petition, and did not appreciate me giving a talk about climate change without acknowledging the vast numbers of his fellow scientists who thought climate science was fake. I was able to restrain myself from laughing out loud, barely. 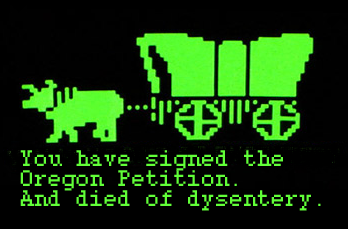 The “Oregon Petition” is one of the most amusing of the major misconceptions used by climate denialists. 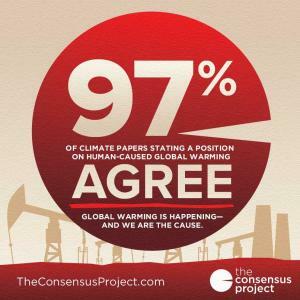 ...demonstrate that the claim of “settled science” and an overwhelming “consensus” in favor of the hypothesis of human-caused global warming and consequent climatological damage is wrong…a very large number of American scientists reject this hypothesis. We urge the United State government to reject the global warming agreement that was written in Kyoto, Japan in December, 1997, and any other similar proposals. The proposed limits on greenhouse gases would harm the environment, hinder the advance of science and technology, and damage the health and welfare of mankind. There is no convincing scientific evidence that human release of carbon dioxide, methane, or other greenhouse gases is causing or will, in the foreseeable future, cause catastrophic heating of the Earth’s atmosphere and disruption of the Earth’s climate. Moreover, there is substantial evidence that increases in atmospheric carbon dioxide produce many beneficial effects upon the natural plant and animal environments of the Earth. To be part of the Oregon Petition, you must agree with this statement. But if you agree with this statement, then you don’t know what you’re talking about. It’s at best wishful thinking, a rosy make-believe fantasy where you hope reality is not what reality is. At worst, it represents a callous indifference toward basic facts. You might think that means a degree in climatology. But the Oregon Petition’s own tabulation lists only 39 of its 31,487 signers as climatologists. That’s not even one percent. That’s one-tenth of one percent. We find this same over-representation of engineers in creationist circles, and the idea of tallying lists of scientists who disagree with science has also found root in creationism, the kissing cousin of climate denialism. The so-called Scientific Dissent from Darwinism, run by the pro-“intelligent design” group the Discovery Institute, has garnered far fewer signatories than the Oregon Petition. And that’s remarkable because the Scientific Dissent from Darwinism statement is so vague—surely everyone is in favor of “careful examination of the evidence,” right?—that one can imagine the scenario where signers did not fully understand the true intent of the statement, as has apparently happened. What the Oregon Petition and the Scientific Dissent from Darwinism lists share is the flawed notion that if one’s ideas fail to pass muster for publication in the normal manner (peer-reviewed journal articles), then one can instead argue for positions in science with the methods of a high school popularity contest. Polls and lists do not decide scientific questions. They might be useful in getting a sense for what scientists think; it’s certainly worth considering that 97% of peer-reviewed climate papers agree warming is man-made, and that major scientific organizations, such as the National Academy of Sciences and the American Association for the Advancement of Science, endorse the consensus. But everyone knows that real science happens with peer-reviewed publications. Petitions and lists of signatories are poor substitutes for real data. Yet the Oregon Petition has consequences reaching far beyond its merit. As I extricated myself from the accusing finger of the man challenging me after my talk at the Geological Society of America meeting, I debated how to respond. Should I tell him about the numerous fake names on the Oregon Petition, which the founder of the petition admitted he had no way of filtering out? Should I point out the oddness of having a cohort of engineers tell climate scientists how to do climate science? In the end, there is no response, no counterargument that will convince a climate denialist whose mind has been made up, despite all the facts available. Like creationists, they operate in a realm where reason is suspect and emotion and intuition hold dominion over all.